Lukkes automatisk når du hever den fra gjæringskaret. Mulig å ha hydrometer inni for enkel avlesning. 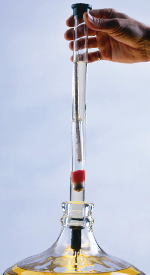 Unique design allows you to insert a standard hydrometer directly into The Thief. High grade acrylic for excellent clarity. Simply dip once for a quick sample. Just touch the tip to the rim to empty The Thief.